"Up here in Calgary [summer of 1999] we have not had a very good year for gardening... It dropped down to about 34º F. for most of one week in July & there was even a few snowflakes. 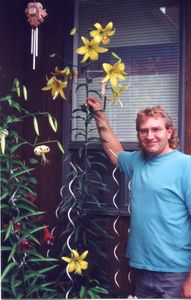 I have enclosed a picture of myself (I stand 6' 2") standing beside the crowning glory of my garden. I was impressed when [Gold Eagle Clone] grew to just under 5 feet the first year. This year the plant amazed me..."
"The bulbs that I have received from your company are among the best that I have ever received from anywhere... Thanks again for caring about quality... I'll be dealing with you for years to come."